The X-15 was a manned hypersonic rocket research aircraft developed during the late 1950s and 1960s by NASA, the Air Force, the Navy, and North American Aviation. X-15s were launched from the air by a B-52 at an altitude of about 45,000 feet, after which time their rocket motors would propel them to hypersonic velocity. The X-15s set several speed records, Mach 4.43 on March 7, 1961; Mach 5.27 ( hypersonic ) on June 23, 1961; Mach 6.04 on November 9, 1961; and Mach 6.7 on October 3, 1967. It also set an altitude record of 354,200 feet ( 67 miles ) on August 22, 1963. A typical research flight lasted 10 to 11 minutes and covered nearly 400 miles along a course that stretched from Smith Ranch, Nevada to Edwards Air Force Base. To acheive its performance and withstand hypersonic stress, the X-15 was made of very strong and light materials, including an internal structure of titanium and a skin of Inconel-X. Three X-15s were built, flying 199 test flights. Apart from the tragic death of USAF Test pilot Maj. Michael J. Adams, who was killed, on 15 November 1967, during flight 191 when his X-15-3 entered a hypersonic spin and broke apart, the program was considered to have been highly successful. 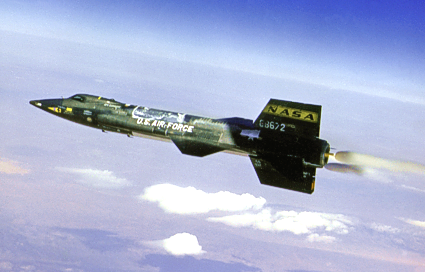 Data collected by X-15 pilots contributed significantly to the understanding of hypersonic air flow, aerodynamic heating, flight control, stability at hypersonic speeds, reaction controls for flight above the atmosphere, piloting techniques for reentry, human factors, and flight instrumentation. All these factors would later assist in the Mercury, Gemini, and Apollo piloted spaceflight programs as well as the Space Shuttle program. The X-15s final flight was performed on October 24, 1968. On May 11, 1962, NASA pilot Joseph Walker said that one of his tasks during X-15 flights was to detect UFOs, and that he had filmed them on two separate occasions, including his record breaking fifty-mile-high flight in April, 1962. During a lecture at the Second National Conference on the Peaceful Uses of Space Research in Seattle, Washington he said: "I don't feel like speculating about them. All I know is what appeared on the film which was developed after the flight." Officials have denied that the films show anything out of the ordinary and have suggested that the objects on the footage are ice crystals breaking away from the X-15. However, the original films have not been made available to the public for independent analysis. Another UFO was seen on July 17, 1962 during an X-15 flight by Major Robert White. He reported that a UFO flew beside his X-15 for about five seconds before darting away above and begind him. White reported: "I have no idea what it could be. It was grayish in color and about thrity to forty feet away." Immediately after his sighting Major White is quoted as exclaiming over his radio, "There ARE things out there!"